Qatar embassy attestation required for those who wish to go to that country for job purpose. Embassy attestation required to get the resident permit from Qatar. Certificate attestation has to be done according to the guidelines given by the Qatar or Qatar MOFA. Your documents or attestation process done on the documents may be rejected by the authorities of MOFA Qatar, if you did not complete the attestation or authentication process according to the guidelines given by the Qatar Government. This authentication process required to prove the genuineness of the documents submitted by you before the authorities. The documents provided by you have to be attested by the Qatar embassy of the country, where it issued to prove the authenticity of it. Qatar embassy attestation required for verifying the authenticity of the documents. The authentication commonly known as attestation proves the authenticity of the documents. If you are applying for a job in Qatar, the authorities need to verify and confirm the documents to prove its authenticity. Therefore, you are asked to attest the documents from the Qatar embassy or consulate in your home country. Actually the embassy attestation process has to be done from the country, where it has been issued, not from the home country of the candidate, but it can be. Later, these documents are again cross-checked and verified by the MOFA Qatar. Qatar MOFA attestation is mandatory for getting admission in schools and universities in Qatar, for getting family/residence visa, for sponsoring your spouse, for starting business and getting the licenses or approvals in Qatar etc. HRD Attestation: The educational documents have to be attested by the Educational Ministry. In India, it has to be from the State HRD Attestation Departments, located in each States. MEA Attestation: All the documents have to be attested by the Ministry of External Affairs. 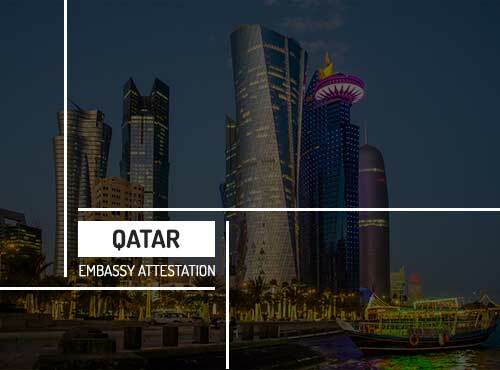 Embassy Attestation: The documents have to be attested by the Qatar embassy/consulate in your home country. MOFA Qatar: The final verification of all the attested documents are done by the Ministry of Foreign Affairs, Qatar. University Verification:As well as Verification from the documents issued departments is required to get the Attestation of the State HRD Attestation Department. Urogulf is one of the most trusted and secure certificate attestation providers in India. Qatar embassy attestation is quite difficult because MOFA Qatar will reject your documents even if a small error occurs. Our experts have 19 years of experience in Qatar embassy attestation which makes them more knowledgeable about the whole embassy attestation process. Our team of qualified experts will guide you through the entire embassy attestation process. We offer you a secure, hassle-free and quick certificate attestation service in India and the Middle East. We provide embassy attestation services for the following documents. Want to know more about Qatar embassy attestation services by Urogulf? Contact our experts to help you through your certificate attestation process. We have branches in India and the Middle East. The documents needed for attestation mainly depend on the purpose of your travel to Qatar; ie. whether you go for job, studies or for doing business etc. Very nice service, they handle the certificate with care and complete the work before date. They have good tracking system. Highly recommended for all your document attestation. I got my documents attested on time as per commitments. Highly professional in all aspects.